You might notice me and Roger listed as editors of this year's CBS abstracts. Joe Francis, our regular editor, had to bow out due to personal commitments, so Roger and I stepped in to complete the editing. My presentation from the 2015 Scopes Festival is now available online for free from Core Academy (it's also free to share on your website). I want to acknowledge one of my primary sources: Philip Pauly's excellent 1991 article, "The Development of High School Biology: New York City, 1900-1925" (Isis 82:662-688). There's a free PDF of the paper available at this link. I just finished watching the NASA press conference, and here are the first high-res photos released from the Pluto/Charon system. 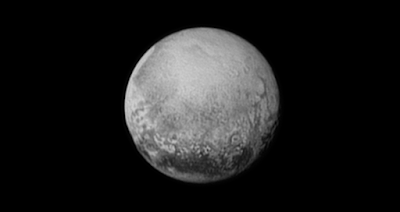 First a close-up of Pluto, and then a full, clear shot of Charon, one of Pluto's moons. Now I'm not a planetary scientist and therefore cannot speak with much authority, but one thing I kept wondering about was how clean the surfaces of both Pluto and Charon appeared. I expected something more akin to the surface of the moon or Mercury, pockmarked with craters, but that's not what we got. Instead, these bodies appeared to be "active," in other words, their surfaces appear to be quite "young." I'll just leave you to draw your own conclusions. What a day! And what a view! So when are we going back? New Horizons 2 anyone? This is it! 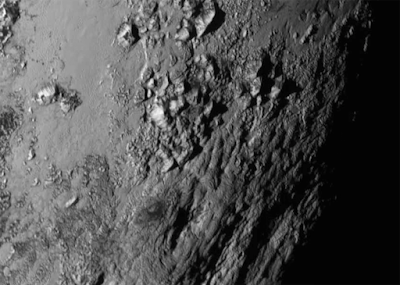 Our first good look at Pluto should be happening right now! If everything went according to plan, the New Horizons probe went silent last night at a little past eleven Eastern time, and it will check in again tonight at a little after nine Eastern time. Why the silence? New Horizons has finally reached Pluto, and it's gathering data on the dwarf planet and its moons. The probe needs to put all its attention on the planet because it is literally moving faster than a speeding bullet! Some of the fastest bullets come out of tank guns, and they travel around 3800 miles per hour. New Horizons is traveling at 31,000 mph, which is almost about 8 times faster than our fastest bullets. To put that in perspective, if New Horizons traveled as fast as a speeding bullet, it would need more than 70 years to get to Pluto. If you wanted to drive to Pluto in your car at highway speed, it would take 4900 years of nonstop driving to get there. I know some of my readers are wondering if I actually shot any content in Yellowstone, or if I just took silly videos and pretty pictures. Actually, I did shoot some content in Yellowstone, and I'll be getting to that over the next few weeks. In the meantime, I hope you'll indulge me for a "pretty" video. I think it's important for creationists to experience creation. I think sometimes we get wrapped up in trying to win arguments, and when we do that, I think the wonder of creation can get lost. The wonder and beauty of God's creation are important to me, and I hope they are to you too. So here, in my simple, clumsy way, I've tried to capture some of that wonder. The next installment of silliness.